See our new book on this topic! STEPS (Strategic Targets for Excellent Performance in SafetySM) to Safety Culture Excellence is a proprietary process for accomplishing safety excellence by targeting and addressing the key competencies, conditions, and common practices that have the greatest impact on preventing accidents and sustaining a culture of performance excellence. The process can be implemented with the assistance of ProAct Safety® consultants or through a Train-the-Trainer process. This advanced methodology includes the development of an overall safety strategy implemented through a stepped process. Each step is prioritized to ensure quick wins, visible progress, and maximum efficiency and effectiveness of effort. The targeting and addressing of issues is managed through the traditional structure of a safety committee or team, thus requiring no additional infrastructure. However, it is recommended that the makeup of the committee or team be reviewed to ensure proper representation and skills needed to deal with the site's safety issues are in place. The majority of training needed for STEPS to Safety Culture Excellence is delivered to this team or committee. 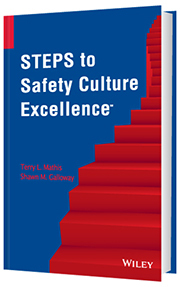 STEPS to Safety Culture Excellence begins with a brief assessment of the site's organization, an analysis of accident and near-miss data, and considering one is already in place, a review of the makeup of the existing safety team or committee. The organization of the site determines the size and makeup of an ideal safety committee or team, and the accident and near-miss data help to identify and prioritize conditions and common practices (management and work force) that most impact accident prevention. Once the makeup of the committee or team is created or complete, the training can begin. All organizations are unique; thus STEPS to Safety Culture Excellence is designed with ultimate flexibility. If your site or group has already mastered a competency or accomplished safety improvements impacting conditions or common practice, steps can be skipped, moving on to the next one that provides the necessary transformation. Each step has support materials designed to facilitate internalization and minimization of external assistance. Should further support be desired, additional training and consulting is available on an as-needed basis. STEPS to Safety Culture Excellence includes an elegant motivational component, eliminating the need for expensive and problematic safety incentive and reward schemes. Moreover, it includes proprietary processes for prioritizing and solving safety problems and issues. These processes can later be applied to other issues and opportunities outside the realm of safety. Thus making STEPS to Safety Culture Excellence a comprehensive strategy for organizational excellence and providing problem-solving methodologies that are universally applicable. Is your organization ready to take the first STEPS to Safety Culture Excellence on the journey toward safety excellence? "Great read and thought provoking." "Fantastic help!! Love this book." "Everyone should read this. Shawn & Terry have a cool way of explaining the complex and making it sound easy. Everyone needs this book!" "Energetic speaker that laid out strategies clearly" "Excellent speaker with a good message" "Mr. Mathis' presentation will help me improve how we look at safety culture. Great class..." "Outstanding presentation!" "Terry Mathis & ProAct Safety really gets it." "Very knowledgeable and enthusiastic presenter. Offered up some good take aways." "Very knowledgeable and shared tips and ideas that can be implemented now."